Juicy, sweet summer fruit is finally here! While you savour their sinfully delicious flavours, feel good about the health benefits they offer. Cherries contain melatonin. Melatonin helps the body know when it’s time to sleep and time to wake up, explaining why some people claim they simply can’t sleep-in on weekends. Melatonin is naturally produced by the pineal gland in the brain. Eating cherries can help improve your body’s melatonin levels to help you sleep better. In a 2012 study, scientists reported that when adult men and women drank tart cherry juice, the resulting increase in melatonin levels improved their sleep patterns. Indulge in handfuls of these sweet, bite-sized berries this summer to help your skin repair damage caused by sunlight exposure. Ultraviolet radiation damages the skin causing it to become red and puffy and to lose its elastic structure. Vitamin C and other antioxidants in raspberries neutralize free radicals that form when skin is exposed to sunlight. Vitamin C is also involved in collagen formation, which gives skin its strong, firm appearance. If the potential for more beautiful skin isn’t enough motivation to eat raspberries, perhaps you’ll find dietary delight in knowing raspberries contain more fiber than any other fruit. A diet rich in fiber supports colon health and can help lower cholesterol levels. 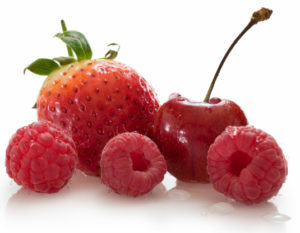 These mouth-watering berries pack more health benefits than you may think. A recent study reported that when participants ate one pound of strawberries a day they experienced heart-healthy changes. Eating strawberries reduced inflammation and lowered cholesterol levels. Seek out your local organic strawberry patch, grab a basket or two, and pick yourself healthy. Watermelon provides significant amounts of vitamin B1 (thiamin) and B6 (pyridoxine) – about 0.1mg per slice. These B vitamins are necessary for energy production. This favourite summer fruit is also a great thirst quencher. Watermelon is 92 percent water by weight and packed with lycopene and vitamins A and C.
Enjoy the healthy benefits of these delicious summer fruits. You can eat them whole, cut up in a fruit salad, or drop some of them into your glass of ice water for a delicious way to rehydrate this summer. Howatson, G. et al. Effect of tart cherry juice (Prunus cerasus) on melatonin levels and enhanced sleep quality. Eur J Nutr 2012;51(9):909-16.